The Tactician, also called a Skill Smith, is a master of knowledge and skill, using their training to further accomplish their goals. Tacticians are common throughout Draconspire and come from all walks of life. Adventures: Adventuring comes easy to the Tactician, their knowledge and skills make them a welcome addition to most parties. The typical Tactician sees this way of life as just another chance to learn and hone their abilities. Characteristics: The Tactician is a martial class, focusing on skills to further advance their offensive and defensive abilities. A Tactician can focus on a few skills, or branch out to cover a wide range in order to diversify to most situations. Alignment: There are no alignment restrictions for the Tactician class. Religion: Tacticians are not restricted to worship of any deity, and in fact most Tacticians take an agnostic or atheist view when it comes to the gods. Those that do decide to believe often pay homage to the Holy Five or to gods within the Shattered Pantheon that have created something in particular that the Tactician is interested in learning more about. Background: Tacticians can come from any region of Draconspire. They can be found in the most crowded of cities or the most remote regions of Dayrmacia. Those that select an urban life tend to specialize in certain skills that can generate a livable income, whereas those from the more wild regions often focus on knowledge and survival skills. Likewise Tacticians come from all backgrounds. They can stem from the most down trodden slums or from elaborate noble villas. The one thing that all Tacticians have in common is a thirst for learning. Races: The Tactician can be of any race, typically focusing on skills that come naturally to their kind. Humans make excellent Tacticians, being able to apply their ability bonus to whatever stat gives them an edge while gaining a free skill point every level. Shadow elves also make natural Tacticians, as their bonus to intelligence similarly gives them more skill points. Other Classes: The Tactician is a martial class, and as such they tend to enjoy the company of competent healers and support classes such as bards and wizards. The Tactician usually respects the skill of rogues and rangers, and the ability of sorcerers and druids. The Tactician can find a niche within most adventuring groups, regardless of its composition. Role: The Tactician is a martial class, and as such they spend a majority of their time facing threats directly. However their level of skill and expertise can allow them to act as a scout, trapsmith, scholar or diplomat depending on how they allocate their precious skill ranks. A versatile and hardy class, the Tactician works best when working with almost any group. Tacticians have the following game statistics. Abilities: By far the most important ability to the Tactician is intelligence, as this stat determines the Tacticians skill points per level. Being a martial and support class, a decent strength, dexterity and constitution score will help the Tactician succeed in combat. Charisma and wisdom may be important to the Tactician, depending on what skills they decide to focus on. Class Skills: All skills are class skills for the Tactician. The Following is a list of class features for the Tactician class. Weapon and Armor Proficiency: The Tactician begins play proficient with all simple and martial weapons, with light and medium armor and with all shields (except tower shields). Advanced Skills: Beginning at 1st level, the Tactician learns to utilize common skills to their full effect. This conveys itself as a bonus based on the number of skill ranks a Tactician has in each individual skill. The bonuses conferred by this ability may not exceed the character’s Tactician level. For example, a character with 1 level of Tactician and 1 level of another class with 2 ranks in Acrobatics only gains a +1 knowledge bonus to reflex saves. Acrobatics (Ex): For every skill point placed in the acrobatics skill you gain a +1 knowledge bonus to reflex saves or dexterity checks performed to avoid becoming prone or against traps. Appraise (Ex): For every skill point placed in the appraise skill you can sell gems, jewelry and art for 1% higher than the base price. Bluff (Ex): For every skill point placed in the bluff skill you gain a +1 knowledge bonus on attacks made against flat footed creatures. Climb (Ex): For every skill point placed in the climb skill you may add 10 pounds to your carrying capacity. Craft (Ex): For every point placed in the craft skill you can create items associated with the respective craft for 1% less in cost of materials. Diplomacy (Ex): For every point placed in the diplomacy skill you gain a +1 knowledge bonus to armor class during the surprise round of combat (if any). Disable Device (Ex): For every point placed in the disable device skill you gain a +1 knowledge bonus to armor class versus attacks made by traps. Disguise (Ex): For every skill point placed in the disguise skill you gain a +1 knowledge bonus to will saves against spells from the illusion school. Escape Artist (Ex): For every skill point placed in the escape artist skill you gain a +1 knowledge bonus to any reflex saves made to avoid or take partial damage. Fly (Ex): For every skill point placed in the fly skill you gain a +1 dodge bonus to your armor class against creatures that attack you from the air (creatures that are flying). Handle Animal (Ex): For every skill point placed in handle animal any mount or pet you own has +1 hit point and +1/2 to all saving throws. You may only have one pet or mount with this ability at a single time. Heal (Ex): For every skill point placed in the heal skill you gain an additional hit point. Intimidate (Ex): For every point placed in the intimidate skill you gain a +1 knowledge bonus to your CMD to avoid being bull rushed, tripped or disarmed. Knowledge (arcana) (Ex): For every point placed in the knowledge arcana skill you gain a +1 knowledge bonus to weapon damage rolls against dragon type creatures. Knowledge (dungeoneering) (Ex): For every point placed in the knowledge dungeoneering skill you gain a +1 knowledge bonus to weapon damage rolls against aberration type creatures. Knowledge (engineering) (Ex): For every point placed in the knowledge engineering skill you gain a +1 knowledge bonus to weapon damage rolls against construct type creatures. Knowledge (geography) (Ex): For every point placed in the knowledge geography skill you gain a +1 knowledge bonus on checks made to resist the effects of starvation, thirst, heat dangers and cold dangers. Knowledge (history) (Ex): When you obtain 5 points in knowledge history you may ignore the penalties for being middle aged, when you obtain 10 points in knowledge history you may ignore the penalties for being old, when you obtain 15 points in knowledge history you may ignore the penalties for being venerable. You still gain the benefits however and die when your time is up as normal. Knowledge (local) (Ex): For every point placed in the knowledge local skill you gain a +1 knowledge bonus to weapon damage rolls against humanoid type creatures. Knowledge (nature) (Ex): For every point placed in the knowledge nature skill you gain a +1 knowledge bonus to weapon damage rolls against animal type creatures. Knowledge (nobility) (Ex): For every point placed in the knowledge nobility skill you gain a +1 knowledge bonus to diplomacy and bluff skills when dealing with a ruler (one that is identified with your use of this skill). Knowledge (planes) (Ex): For every point placed in the knowledge planes skill you gain a +1 knowledge bonus to weapon damage rolls against outsider type creatures. Knowledge (religion) (Ex): For every point placed in the knowledge religion skill you gain a +1 knowledge bonus to weapon damage rolls against undead type creatures. Linguistics (Ex): For every point placed in the linguistics skill you gain a +1 knowledge bonus to will saving throws made against spells that are language dependent. Perception (Ex): For every point placed in the perception skill you gain a +1 knowledge bonus to initiative checks. Perform (Ex): For every point placed in the perform skill you gain a +1 knowledge bonus to saving throws made against spells or effects with the sonic descriptor. Profession (Ex): For every point placed in the profession skill you gain 1% extra pay when performing work related to the applicable skill. Ride (Ex): For every five points placed in the ride skill you increase the base speed of a mount you are riding by 5 feet. Sense Motive (Ex): For every skill point placed in sense motive you gain a +1 knowledge bonus to your will saving throws against spells from the enchantment school. Sleight of Hand (Ex): For every point placed in sleight of hand you gain a +1 knowledge bonus to your disarm attempts. Spellcraft (Su): You gain spell resistance equal to 5 + the number of skill points you have in Spellcraft. Stealth (Su): For every skill point placed in the stealth skill your concealment miss chance for attacks made against you increases by 1% when in areas of low light or poor illumination (to a maximum of 50%). Survival (Ex): For every skill point placed in the survival skill you gain energy resistance 1 to your choice of fire, cold, electricity or acid. This is a permanent selection once made. If an ability, such as reform mind, reduces the number of skill points you have in survival, you must reduce a resistance bonus granted by this ability an equal amount. Swim (Ex): For every point placed in the swim skill you may hold your breath for an additional 2 rounds while performing a swim action. Use Magic Device (Su): For every point placed in the use magic device skill you gain a +1 knowledge bonus to overcome spell resistance with any magical item that you may use. Secret Knowledge: At 2nd level, and again at 5th, 8th, 11th, 14th and 17th you gain access to a secret knowledge as outlined below. You may not select the same knowledge twice unless it states otherwise in the description. Spell Conduit (lesser) (Sp): Select a single 1st level arcane spell from the sorcerer/wizard list. You may cast this spell as a spell like ability three times per day. The DC to resist this spell (if applicable) is equal to 11 + your intelligence modifier. Your caster level for this spell like ability is equal to your Tactician class level. Spell Conduit (Sp): Select a single 2nd level arcane spell from the sorcerer/wizard list. You may cast this spell as a spell like ability three times per day. The DC to resist this spell (if applicable) is equal to 12 + your intelligence modifier. You must have selected Spell Conduit (lesser) previously in order to select this ability. Your caster level for this spell like ability is equal to your Tactician class level. Spell Conduit (greater) (Sp): Select a single 3rd level arcane spell from the sorcerer/wizard list. You may cast this spell as a spell like ability three times per day. The DC to resist this spell (if applicable) is equal to 13 + your intelligence modifier. You must have selected Spell Conduit previously in order to select this ability. Your caster level for this spell like ability is equal to your Tactician class level. Druidic (Ex)/(Sp): Through research you have learned the druidic language (Ex). In addition, select a single level 0 druid spell, you gain the ability to cast the selected spell three times per day, treating your Tactician level as your druid level. This is a spell like ability, the DC related to this ability is equal to 10 + 1/2 of your Tactician level + your intelligence modifier. Once selected the chosen spell cannot be changed. Weapon Knowledge (Ex): You gain exotic weapon proficiency in the weapon of your choice. If you have or obtain at least 5 ranks in knowledge local you also gain weapon focus as a bonus feat with the selected weapon. If you have or obtain at least 10 ranks in knowledge local you also gain weapon specialization as a bonus feat with the selected weapon. Combat Log (Ex): You keep an extensive log regarding the creatures you have faced in combat. Whenever you personally kill a non-humanoid creature you gain a +1 insight bonus to armor class against that specific creature type in the future. For example, if you personally land the killing blow against an ogre you gain a +1 insight bonus to your armor class in any future combat with ogres (not against all giant types). Photographic Memory (Ex): Whenever you look at a written language you can perfectly recall the image of the writing as though it were right in front of you still. This clarity lasts for a number of days equal to your levels in the Tactician class. Poison Syphon (Ex): You know how to extract poison from a wound. You may perform a heal check as a standard action to end the ongoing effects of injury poison, the DC to successfully end the ongoing effects is equal to the poison DC. Amorphous Mind (Su): You can slowly reform your mind. Once per day, as a full round action, you may move a single skill point from a skill to another skill. Undead Anatomist (Ex): Your study of undead anatomy has honed your ability to inflict maximum damage. Whenever you threaten a critical hit against an undead creature the critical hit is automatically confirmed. You must have at least 5 ranks in knowledge religion to take this ability. Dragon Anatomist (Ex): Your study of dragon anatomy has honed your ability to inflict maximum damage. Whenever you threaten a critical hit against a dragon creature the critical hit is automatically confirmed. You must have at least 5 ranks in knowledge arcana to take this ability. Elemental Hunter (Ex): Your knowledge bonus to damage for ranks in knowledge planes also applies to creatures of the elemental subtype. You must have at least 5 ranks in knowledge planes to take this ability. Elemental Executioner (Ex): Your knowledge of elemental composition surpasses most. You gain the ability to perform critical hits against creatures of the elemental type. You must have previously selected the Elemental Hunter ability to select this ability. Nature Hunter (Ex): Your knowledge bonus to damage for ranks in knowledge nature also applies to creatures of the fey or plant subtype. You must have at least 5 ranks in knowledge nature to take this ability. Giant Hunter (Ex): Your knowledge bonus to damage for ranks in knowledge local also applies to creatures of the giant subtype. You must have at least 5 ranks in knowledge local to take this ability. Slime Hunter (Ex): Your knowledge bonus to damage for ranks in knowledge dungeoneering also applies to creatures of the ooze subtype. You must have at least 5 ranks in knowledge dungeoneering to take this ability. Swarm Slayer (Ex): Your study of swarm anatomy has honed your ability to inflict maximum damage. Swarms that are generally immune to weapon damage instead take ½ damage (rounded down) from your melee attacks. Fortified Immune System (Ex): Your body naturally fights off disease. For every skill point you have in the heal skill you gain a +1 knowledge bonus to saving throws against disease. Overload Wand (Su): You can heighten the use of wands by expending more of their power. When activating a wand with the use magic device skill you may elect to expend additional charges to increase the caster level. For every additional charge you expend you may increase the caster level by 1 to a maximum caster level equal to your Tactician level. You must have at least 5 ranks in the use magic device skill to select this ability. Spell Arbalest (Su): You may use your CMB instead of your caster level when casting spell like abilities to overcome spell resistance. Skill Depth (Ex): Your character level is treated as 1 level higher when determining your maximum skill ranks. For example, a 2nd level Tactician that takes this ability would be treated as 3rd level when determining how many skill points could be invested in each skill. This ability can be taken multiple times. Swift of Foot (Ex): You gain uncanny dodge as the Rogue class feature. You must have at least 5 ranks in acrobatics prior to selecting this ability. Alacrity (Ex): You gain improved uncanny dodge as though you were a Rogue, treating your Tactician level as your rogue level. You must have selected Swift of Foot prior to selecting this ability. Trapsmith (Ex): You gain trapfinding as the Rogue class feature, treating your Tactician level as your Rogue level. You must have at least 5 ranks in perception prior to selecting this ability. Animal Trainer (Ex): You gain the Creature Companion feat. You must have at least 5 ranks in handle animal prior to selecting this ability. Spell Armor (Su): Your spell resistance is now equal to 10 + your ranks in spellcraft. You must have at least 5 ranks in spellcraft prior to selecting this ability. Shadow Stalker (Ex): You ignore 1% of a targets concealment for each rank you have in the stealth skill. Expert Swimmer (Ex): You gain a swim speed of 10 feet. You must have at least 5 ranks in swim prior to selecting this ability. You do not however gain a racial bonus to swim checks. Master Swimmer (Ex): You gain a swim speed of 20 feet. You must have at least 10 ranks in swim prior to selecting this ability. You do not however gain a racial bonus to swim checks. Expert Climber (Ex): You gain a climb speed of 10 feet. You must have at least 5 ranks in climb prior to selecting this ability. You do not however gain a racial bonus to climb checks. Master Climber (Ex): You gain a climb speed of 20 feet. You must have at least 10 ranks in climb prior to selecting this ability. You do not however gain a racial bonus to climb checks. 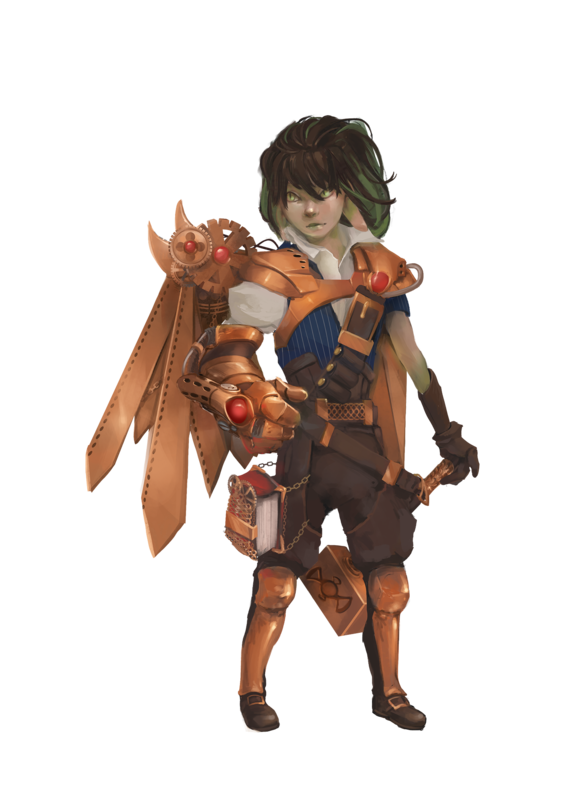 Tinker (Basic Wings) (Ex): You have crafted a set of mechanical wings. These wings occupy your shoulder slot and grant you a fly speed of 30 feet with clumsy maneuverability. You must have at least 5 ranks in knowledge engineering prior to selecting this ability. Your wings are a mechanical item that can be removed or equipped as a full round action, if destroyed it takes three days and materials costing 300 GP to replace. Your wings have a hardness equal to your ranks in knowledge engineering and hit points equal to twice your ranks in knowledge engineering. The skill required to craft and use this item requires a deep knowledge of one’s own body, and as such it is not possible for the Tactician to craft this item for another creature or for another creature to use this item. Tinker (Advanced Wings) (Ex): Your fly speed is increased by 10 feet and your maneuverability is increased by 1 step. This ability can be taken multiple times, its effects stack. You must have the Tinker Basic Wings ability prior to selecting this ability. Tinker (Basic Leg Braces) (Ex): You have crafted a set of mechanical leg braces. These braces occupy your feet slot and grant you an increase in land speed of 10 feet. You must have at least 5 ranks in knowledge engineering prior to selecting this ability. Your braces are a mechanical item that can be removed or equipped as a full round action, if destroyed it takes three days and materials costing 300 GP to replace. Your braces have a hardness equal to your ranks in knowledge engineering and hit points equal to twice your ranks in knowledge engineering. The skill required to craft and use this item requires a deep knowledge of one’s own body, and as such it is not possible for the Tactician to craft this item for another creature or for another creature to use this item. Tinker (Advanced Leg Braces) (Ex): Your land speed is increased by an additional 10 feet. This ability can be taken multiple times, its effects stack. You must have the Tinker Basic Leg Braces ability prior to selecting this ability. Tinker (Arm Cords) (Ex): You have crafted a set of mechanical arm cords. These cords occupy your hand slots. While wearing your arm cords you can wield weapons as though you were one size category larger without penalty. You must have at least 5 ranks in knowledge engineering prior to selecting this ability. Your arm cords are a mechanical item that can be removed or equipped as a full round action, if destroyed it takes three days and materials costing 300 GP to replace. Your arm cords have a hardness equal to your ranks in knowledge engineering and hit points equal to twice your ranks in knowledge engineering. The skill required to craft and use this item requires a deep knowledge of one’s own body, and as such it is not possible for the Tactician to craft this item for another creature or for another creature to use this item. Skill Boost (Ex): Beginning at 3rd level you gain the ability to boost a single skill once per day as a free action. This boost allows you to add your Tactician level to the selected skill for 1 round. You gain an additional use of this ability every three levels thereafter to a maximum of 6 times per day at 18th level. Skill Focus (Ex): At 4th level, and every three levels thereafter, you gain skill focus as a bonus feat. Ultimate Knowledge: At 20th level you discover an ultimate ability, the pinnacle of your thirst for knowledge. Deadly Knowledge (Ex): Any time you critically hit a creature in which you are applying a +10 knowledge bonus (or higher) to damage, that creature must make a fortitude saving throw or immediately be slain. The DC to resist this effect is equal to 10 + ½ of your Tactician level + your intelligence modifier. Resuscitate (Ex): You may, as a standard action, bring back to life a recently slain comrade. Use of this ability requires a heal check, DC equal to the subjects current negative hit point total. If successful the target is no longer dead and immediately heals 1D20 + your Tactician level in hit points. If after a successful resuscitation the target is still at negative hit points they become stable and are no longer dead or dying, even if their current hit point total would still place them in dead status. You must use this ability within one round of the targets death or it has no effect. Spell Catalyst (Sp): Select a single spell of levels 4 through 9 from the sorcerer/wizard list. You may cast these spells as a spell like ability each once per day. The DC to resist these spells (if applicable) is equal to 10 + the level of the spell like ability + your intelligence modifier. You must have selected Spell Conduit (greater) previously in order to select this ability. Your caster level for these spell like abilities is equal to your Tactician class level. Reform Mind (Su): Your mind can be reformed every day. Once a day, as a full round action, you may reassign your skill points freely between two skills. Always Ready (Ex): Your mastery of skills has left you always ready, regardless of the situation. You may now use the ready action to ready full round actions (instead of the typical standard action).